Fanny Crosby (1820-1915) was blind. She blamed her blindness on a controversial treatment she was given for swelling in her eyes when she was just six weeks old. Modern physicians believe she was born blind due to a congenital condition. Either way, Fanny lived her life in darkness. That didn’t stop Fanny, however, from becoming one of the most influential writers of her generation. She composed poems for Congress. She recited her poetry to presidents. She regularly contributed to the Saturday Evening Post. She also wrote the words to over 8,000 hymns. Among her many influential friends and collaborators was Phoebe Knapp, daughter of a notable Methodist preacher of the day and an accomplished organist. So began the collaboration which produced one of the most beloved hymns of all time. Oh what a foretaste of glory divine! Fanny Crosby was sure. She was certain she was going to heaven. For years, as I visited our local nursing home, a wonderful man named T.J. attended my Bible Studies. Among other things, T.J. was one of the best domino players I have ever met. In the course of our Bible Studies, I would often ask the residents if they were going to heaven. “I hope so,” was always T.J.’s response. “Yes, sir,” T.J. would always respond. “Then you are going to heaven for sure,” I would tell him. T.J. is now with his Savior in heaven. So is Fanny Crosby. I can be sure of that, not because of anything they did or who they were, but because of who Jesus is and what he did. I can be sure because the Holy Spirit worked faith in their hearts – faith which they publicly confessed. It is not arrogant or presumptive to be certain you are going to heaven. It doesn’t depend on you. You have messed everything up. One sin condemns. You have thousands. You have said what God said not to say. You have touched what God said not to touch. You have gone where God said not to go. You deserve hell, but you can be sure you are going to heaven, because it doesn’t depend on you. You can be sure because Jesus said, “It is finished.” You can be sure because the minister poured water on you and said, “I baptize you in the name of the Father and of the Son and of the Holy Spirit.” You can be sure because God promises it to you and God does not lie. Fanny Crosby was blind, but through faith she could see. Through faith she could be sure. So can you. 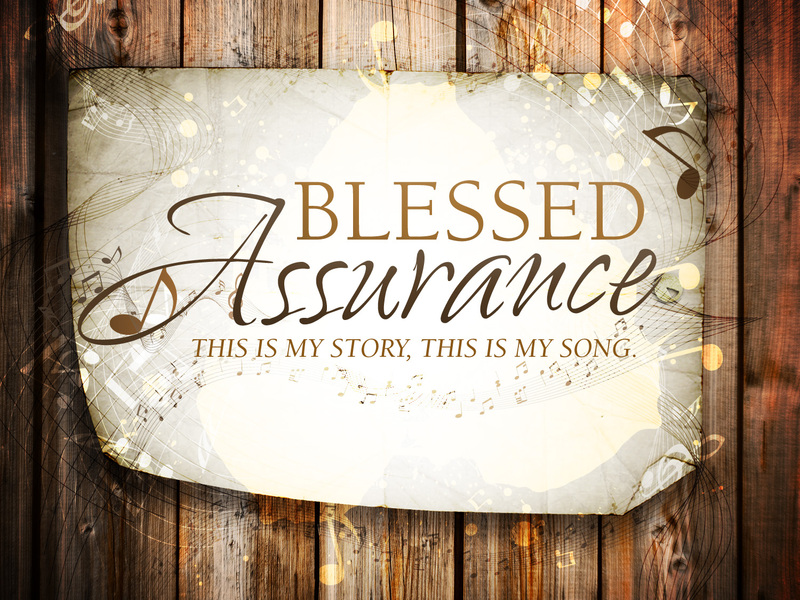 May God grant you that blessed assurance. “Now faith is being sure of what we hope for and certain of what we do not see” (Hebrews 11:1). Andrew, this story reminds us that we CAN overcome obstacles through Christ and write the words we’ve been given in Jesus’ Name. Thanks. I’ll highlight your post on the Christian Poets & Writers blog. God bless. http://www.christianpoetsandwriters.com. I love the stories behind the hymns ~and I especially love the hymns of Fanny J. Crosby. Thank you. Very amazing and touching story! may God bless and help us to fulfil his promise.